It's not easy for an actor to escape a role they seem to have been horribly typecast in, but ever since the Potter franchise ended in 2011, Daniel Radcliffe has done a bang up job of it. 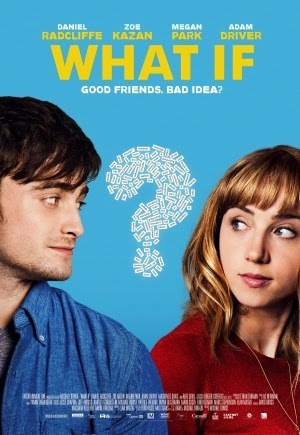 Ranging from horrors to dramas to dark fantasies, his resume is steadily expanding beyond his renowned origins, and this continues with the charming rom com What If. If you're confused, it's called The F Word overseas. Young medical student Wallace (Radcliffe) is repulsed by love since he broke up with his ex, but when he stumbles across Chantry (Zoe Kazan) at a house party, he becomes immediately infatuated once again. Finding out she has a boyfriend soon after they meet, their bond falls into the friend zone - but as time goes on, flourishes more than they may have initially thought. Though it seems content to recycle countless genre conventions, What If manages to stand its ground with a quirky script and a fantastic cast, all of whom perform brilliantly. Radcliffe himself demonstrates a level of comedic talent to further credit himself as a diverse actor, and Zoe Kazan shares a wonderful chemistry with her co-star. Her character lacks the likeability of Radcliffe, but regardless, she has her own charms to support their on screen bond. Supporting actors include Adam Driver, Rafe Spall and Adam Driver; them and their characters also fuel the films fast paced sense of humour. There are issues with pacing in the middle, originating from the film trying too hard to be funny. It never fails to generate laughs, but sometimes favours them over developing the actual storyline - a trait that may get rather annoying to some. Everything is smartly penned by the clearly talented Elan Mastai, but some characters really know how to get on your nerves; namely Megan Park as Dalia, Chantry's irritating sister. But with all these issues aside, What If remains a charming comedy with an upbeat spirit, understanding the emotional weight of its story without being too depressing or pretentious.